Supurb racing simulator, featuring realistic driving physics and an excellent online multiplayer. 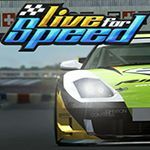 For more information visit www.liveforspeed.net - from there you can download a demo that features 3 cars, the XF GTI, XR GT and XR GT Turbo, and 2 tracks, as well as the online mode. Get racing! A truly amazing game, and one of my favorite video games in general. Extremely detailed, realistic and good graphics. I love it when in car/race games that they bother to put in details such as working hazard lights, turn signals, horns, headlights, et cetera. There are quite a few glitches though, mainly with wrecks (like there is no real sound during crashes). Decent car choices, although they left out some important types of cars (mainly muscle cars). And best of all, you can get just about everything free. Not everything in the sense of all the cars (you start out with the XF GTi, XR GT and XR GT Turbo) and tracks (just the three variations of the Blackwood circuit), but you get to use everything. Online play (the best part of the game for me), all the car's features and customization. Of course, I bought the Full S2 package because it was so awsome (and I got tired of the same cars and same track), and must say it was completely worth it. This game is soo realistic, you can change basically every bolt on the car to suit your driving style. The throttle response and steering is above everything, heck!, when you play this game you actually feel like a real race driver. Note that the driver depicted in the shots is a modification, and not the default racing driver found in the game. I just noticed that, he didn't look like a racing driver. I've just seen your trailer Star Wars Fanatic, amazing work. At long last, the full version is being released tonight! Picture in location is added. We should split Live for Speed into S1 and S2. Why? Graphic update, Blackwood Circuit looks waaaaaaay better (especially the first chicane got a new layout being more sharper and thereby slower), new tracks, new Cars. Its like a whole new game AND you had to pay again. So if you have paid for S1, you paid again to unlock S2. But guys... still the open question: Should every version (S1, S2 and S3) have its own page? Graphics were highly improved from S1 to S2 and we got new content. You also had to pay for every game, so its more than a patch. Remember: We also gave Train Simulator a new page every year, despite being only a patch that is released once a year. But you can also buy it in store. So same case. The VW Scirocco was removed from game, probably because the car is out of date considering how often the release of S3 was pushed back. Mieguy wrote The VW Scirocco was removed from game, probably because the car is out of date considering how often the release of S3 was pushed back. The Scirocco hasn't been removed, it just hasn't never been released (yet). It will come. Developers said tyre physics for the car have been the real issue, and the cause of the huge delay. A unplayable car was found in 0.6H in Westhill.